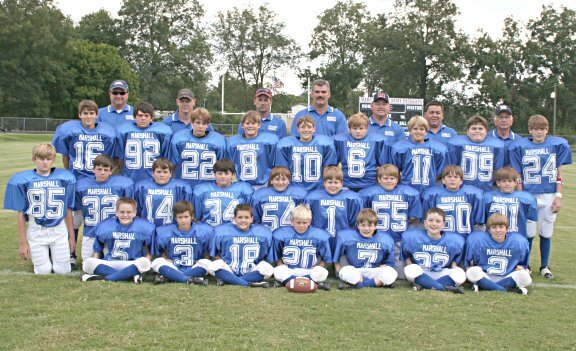 The football team of Marshall Academy in Holly Springs, Mississippi. The town is 79% black. Segregation academies (1955 – ) were set up by whites after Brown v. Board (1954) to circumvent desegregation. They proliferated in the 1960s-1970s in response to court desegregation orders. By the 1990s, following white flight and residential resegregation, many either shut down or were compelled to admit non-white students. Today, they remain a bastion of the “Black Belt”, particularly the Mississippi delta. White officials in districts with segregation academies severely restrict funding to the public schools, which become overwhelmingly black. Few jurisdictions voluntarily desegregated schools after Brown v. Board. Housing segregation created by restrictive covenants, kept in place by blockbusting and racial steering, led to racially gerrymandered school districts. That was easier in places which had more than one school each for blacks and whites, but difficult in sparsely populated rural districts which did not lend easily to white flight. Prince Edward County, Virginia, a rural county between Richmond and Charlottesville, took extreme measures. In 1959, it halted funding for public education, effectively shutting down all its public schools. White parents opened the Prince Edward Academy, leaving blacks with no school to attend. 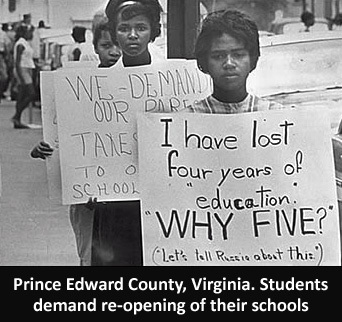 The U.S. Supreme Court ordered the county to reopen their public schools in 1963, which they appealed. In 1964, the order was upheld, but the Academy persisted with minimal funding for public schools. In 1978, the Academy lost its tax status, but did not admit non-white students until 1986. All the more reason to homeschool your offspring, which I support 100%. Instead of all these mega-churches and a storefront church on every corner, we should be diverting some of our resources away from big cars and houses and designer clothing and shoes and alcohol INTO schools and businesses. I have done some research into segregation. Many black leaders back then wanted the end of Jim Crow apartheid. They wanted the same resources that many whites had in terms of education without excluding the cultural identity of black people. They wanted to end government mandated oppression, so they could have freedom to educate their own children without discrimination and without racist terror from white racists (they didn’t want us to be integrated into the system of white supremacy. They wanted that system to end, so a system of justice can transpire). Today, many whites have formed segregated enclaves and they make no bones about their hatred of black people. Black people deserve independent educational facilities to teach black children about their culture, history, economics, politics, engineering, technology, and all important subjects. In other words, as a black man, I can learn a lot of enlightening information living around with just black people. Some black people feel like that they can only learn something groundbreaking when they encounter a majority white community (which represents an inferiority complex, because there are tons of black people with great intelligence). I have no problem with the growth of black economic enterprises. I do have a problem with economic inequality and workers’ rights being violated. There is nothing wrong with self-determination, community growth, and great schools. I read the article. The article just refutes the notion that all black people responsible for our own oppression. After anyone reads that article, they should never ever blame all black people for the school to prison pipeline system. The story documents that black youths have been placed into jail just for minor offensives, suffered tear gas, and suffered massive abuse by guards and others. This story makes me very angry. It shows how white racism is an abomination and bourgeois Negroes (who want to blame this school to pipeline system on black kids collectively) should be ashamed of themselves for real. We know that zero tolerance has not worked. People have tried zero tolerance for decades and the prison industrial complex has massively grown since 1980 especially. Enough is enough. There has to be alternatives like counseling, mentorships, and other interventions instead of just jailing kids. We do know that black kids are punished more harshly on average than white kids in the school system if they are guilty of the same offense. Many white teachers have a cultural misunderstanding about black kids expressing themselves. This misunderstanding causes some white teachers to send a black child to outright suspension when the punishment can require just in school suspension or just being sent to another classroom. I’m glad of this story, because activists are fighting back against these evils. This is not just happening in Mississippi and Florida. This abuse of black children is occurring nationwide. People have to treat black children as human beings. I do recommend the article for anyone. Thank you for your comments and for reading the article (I know it was kind of long). White supremacy is everywhere in this country, and in all of the institutions, and the school system is one of the places where white supremacy is the worst. There are a lot of people who still believe that Black children behave worse than White children, even though studies have should that Black children receive worse punishments than White children for the same offenses. This should make people angry. When children are signaled out for punishment in the schools, they are tracked to go into juvie hall. A member of my church told me about five years ago that that once kids are placed in juvie hall, they stay there until they graduate. That means when they apply for a job or to go to college, their alma mater is juvie hall, and it will be hard for these kids to find a job or get into a college. I read an article a few years ago in TIME Magazine that showed that in North Carolina, students who were discipline problems were expelled from school shortly before standardized tests were given. This was done because these students were poor academically and the school district did not want these kids to lower the school*s standardized test scores. Chicago and Philly are two of the major cities that are closing schools in Black neighborhoods (yet white supremacists accuse us of not caring about education). I read **Savage Inequalities** last year and it shows a great deal about how poor, nonwhite children are treated in America*s school. I have heard about the book **Sundown Towns**. There was a suburb of Cincinnati (I think) a couple of years ago that voted against bus routes in their areas to keep the Blacks out. Whites are showing us that they do not want us around in one way or another. Shanequa, thank you for working with the children in the schools and the juvenile justice system. I worked as a substitute teacher for 10 years for Grades Pre-K through Eight, and I taught as a full-time teacher for three years (these were three years of hell — ninth grade for one year, and seventh-grade for two years). There are a lot of problems in the school system. No Child Left Behind made a bad situation worse. The kids who have problems in the home are given the counseling that they need. Sometimes the counselors do not want teachers sending the students; the students have to set up appointments to see the counselor, and kids are shy to do that. A lot of kids don*t care about learning because they come from homes where education is not valued. A lot of kids cannot read even in the third grade because teachers cannot fail children who are not passing, so students are being promoted who have not learned anything. NCLB meant that students who were not making passing grades could not be held back, and as I mentioned earlier, students who fare poorly academically (and are discipline problems) are expelled from school to keep CRCT and other standardized test scores up. And to top that off, students are not really being taught to learn anything, but are being taught to the test. I*m really sorry about the long rant, but after what both of you have said, I had to get this off my chest, since I have also had experience teaching in the school system. I hope that I have added some perspective to this conversation. Those are excellent words from you Sister Courtney. You have brought great words to the conversation. As you would say, I can’t respond much to your words, because you have shown excellent commentaries. Many black kids are treated worst than white kids (even if they accused of the same offenses) because of the biases that some people have of black children. The false stereotypes of black children having inane aggressiveness and being genetically prone to disruption must be repudiated completely. The obsession of standardized testing has not massively improved education in America. I have studied Finland and Finland has great ideals in helping our educational system including the actions of the state of Massachusetts. Many other American teachers have shown great advice which includes: striving to have small class sizes, reward teachers who are making great results, promote digital literacy (especially for communities of color and poor communities), nutritional programs, the development of the quality of life of children, allow more teacher collaboration, make curriculums more based on creativity, fight economic inequality, work on parent/teacher relationships, allow the schools to work with communities and vice versa, and other solutions. We do care about education a great deal while white supremacists have closed down many schools in mostly black neighbhorhoods. Thank you for showing your story. Your story can bless others and as our words can motivate people to help society in general. They feel that they have attained the “good life” and “I got mine”, “others get theirs.” And attitudes such as these are NOT helping our younger generation. Middle and high school talented Black students are bused to white areas to boost their numbers so that their schools will not be closed (when these students got their smarts from their home schools in the inner-city) This is just one method for justifying what school board officials are doing, These schools in the inner-cities have been set up for fail to be purged, only to replace the staff with those that serve Hispanic students only. This is nothing more than RACISM on steroids. Thank you for responding. And thank you for being an administrator that actually cares about our children. Too many administrators (Black and White) that I have dealt with as a substitute teacher and a full-time teacher did not care about the kids, but only cared about keeping their jobs. It is like you said, they feel that since they have theirs, they do not have to care about anyone else. I have heard about ethnic cleansing of Black neighborhoods on the West Coast by Latino gangs. In many of these gangs, they kill a Black person as an initiation. However, the stuff with the school takeover?! I did not realize the situation was that bad, but maybe I should have. Yes, they are closing schools in Black neighborhoods, which breaks up the Black community. Poor White schools are not being closed. In fact, a lot of things that happen in the Black schools would not happen in White schools. For example, teachers are told not to send disruptive kids to the office (when I was in school, kids who acted up in class were sent to the office and the principal dealt with them and their parents), because that means that we **lose credibility** and that **we can*t control the classroom. ** That is total BS. Getting disruptive elements out of the classroom means that you trying to REGAIN control of the classroom. When disruptive kids cannot be sent to the office, that means that the teacher spends more time disciplining kids instead of teaching them, which means that the kids who want to learn are not learning. Black parents need to become demanding of the school system. And that means getting on the people who are IN CHARGE, which is not the teachers. There is too much teacher-bashing going on. One of my colleagues when I was subbing told me, **The problem is that the teachers are held accountable, but the kids aren*t held accountable, and the parents aren*t accountable. ** When I was in school, we were held accountable for our schoolwork and our behavior. Math was my weakest subject, yet I took it upon myself to stay after school for tutoring and asking my teachers for help. Now everything is the teacher*s fault. Back then, kids who talked back to teachers were suspended; now, kids are so disrespectful to teachers, because they have been allowed to get away with so much. I strongly believe that one of the things that screwed up the public school system in this country was when we took accountability away from the kids. Now this education reform is total BS. It*s all about teacher-bashing, and profits taking over the schools. They want two school systems — one for the rich, and other one for everybody else to work for the rich. I have heard people say this a lot. It is very sickening! What’s even more sad is we have majority of black public schools that are closing down. Whites make it known that they want to be segregated from black people period. Our people feel so inferior that by moving to a majority white school or neighborhood would be better for them with more opportunities. A couple of years ago I read a book name “Sundown Town” an it explain the history of white flight which involves residential housing, schools, & etc. In those white flight towns or certain areas in a city doesn’t allow black people in after dark. I have worked part-time in the school district & juvenile department with young black children from impoverish communities to academics disadvantage. Those black children are already face with racism, living in dysfunctional families & suffering from stress as well as depression. I talked too many of those black children I’ve work with an they are not bad children. One young black male in kindergarten witness his mother get killed. I had another black male child who was born a crack baby, mother is still strung out on drugs, the father is with another woman taking care of a new family but his son is being raised by his grandmother. I found out recently the little boy is a schizophrenic. I deal with young black females who have self-esteem issues from skin color to hair. Juvenile is a small jail until they graduate on too the actual prison system. I have seen several of those black children have return back because they are repeated offenders. I was working at one juvenile facilities an the detainee told me “its real quiet & nice here then the other facilities.” These children are already expose to drugs because their parents are drug user an its in their environment. The education system has failed black children all together. I work with black children in third grade who can’t read one word. These black children need intervention programs to help them succeed run by our own people. I can go on all day of what I witness but I will make a long story short. I had to leave the educational field because it was to depressing & stressful. Thank you for your words Sister Shanequa. I agree with you 100 percent. This situation is found nationwide. It is really disturbing and depressing that young black youth are being mistreated in this fashion. Many poor communities (as opposed to rich communities who have state of the art technology, healthy foods, art opportunities, music classes, and a strong educational infrastructure) don’t have the resources to deal with the problems that numerous children face. The problems that young people face are complex and the haters and the scapegoaters exploit these issues as a means for them to assign collective blame to all black children (especially poor black children). Racism, dysfunctional families, economic inequality, and other problems are some of the reasons why many children have problems. We have to discuss about these issues and execute solutions. Our modern day society is a reflection of neglect. For far too often, society has shown so much disrespect, so much hate, and so much neglect, that of course, we will see numerous kids acting in rebellion to the system or acting up more nihilistic. A lot of times when we see kids acting up, it is a way for the children to express a cry for help. When some kids go to school, the school may be the only place where they won’t be physically abused or where they find something large to eat. They are crying for help, love, and compassion. Instead of constantly yelling at them, we need to find a place where they can express how they really feel and talk about their own concerns (in allowing them to channel that aggression in the positive direction). Yes, we as black people, are perfectly qualified to deal with the issues found in black children. Your story in dealing with the educational system is not uncommon. Your story and others prove that the educational system has failed our children. Some black children do persevere, but when one black child suffers, we all suffer. Some teachers suspend a child at a drop of a hat, especially the black kids as studies document. We see many black girls been targeted for suspension and jailing too. The children in these conditions harbor a strong revolutionary spirit. We can harness their aggression in the positive direction. There has to be a massive revolutionary program to address this indeed. White richer educational schools would never tolerate this. We shouldn’t either. Definitely, black people (across classes) must come together and massively intervene (via mentorships, independent schools, child care services, after school programs, the expression of activism to end zero tolerance, etc.) as a way for us to save the lives of young black children. People need compassion not permanent condemnation. I also want to thank Sister Courtney for showing the link too, because people need to read this information. We are still fighting for our liberation. @ Timothy & Courtney thank you both. That’s an excellent link Sister Courtney. It shows that even when black people do everything right and set up our own independent power base, white jealous racists have attacked us. That is why self-defense and black people being trained to own guns to defend their communities is so important. First, we know that mainstream studies show the great benefits of homeschooling. On average, homeschooled children can achieve great things academically, career-wise, etc. I have known that there is a recent upsurge of African American families homeschooling their children. I have no problem with this. Every child, regardless of his or her color, has the right to have equal educational opportunities. One problem is that certainly excellent educational opportunities are highly expensive. The rich get better educational services than the poor on average because of the distribution of resources. The poor readily lack critical funding and resources as compared to the rich. That must change. I loved how the article talked about how many schools refuse to give black children comprehensive information on real black history. Some schools just show history about slavery and the civil rights movement (and not much else). The truth is that black history is very diverse filled with stories of governmental leaders, Kings, Queens, architects, inventors, artists, engineers, and advanced civilizations. White supremacist Eurocentric propaganda is found all over Western society. Black parents are tired of this and they want the best for their children. This trend of homeschooling will continue. Not all families will homeschool their children as education can be found in diverse fashion. In other words, you can homeschool or go through non-homeschooling channels as a way for the youth to get a great education. Yet, any family has the right to homeschool their children if that family wants to. Some countries ban homeschooling. Germany totally bans homeschooling except with few exceptions. I do believe that any homeschooling system must have the adequate socialization programs (so kids can interact with children), proper educational curriculums, and certified teachers too. There is also those in the conscious community who want to build up independent pro-African educational facilities. As Dr. Amos Wilson has said, educating black children on their real history and culture is of paramount importance. Black children must be told the truth on the greatness of their own BLACKNESS. Homeschooling is one solution (not all people will utilize it) and also we have to respect other diverse educational systems that are helping people as well. I do disagree with zero tolerance policies as they contribute to the school to prison pipeline system. At the end of the day, we want children to receive the best education possible. Thank you for reading the article. It was very interesting. I have heard about more Black families homeschooling their children. I am glad the article pointed out that Black families homeschool their children for different reasons than White families. That needs to be understood. I am glad that these parents are giving their children Afrocentric education. If it*s okay for Whites to give their children Eurocentric education, it*s okay for Blacks to give their children Afrocentric education. I am glad that the article pointed this out, too. Children need to have equal educational opportunities. However, in this country, in the public school system, that is not going to happen, since **the haves** want the best for their children and to h*ll with **the have nots. ** I mentioned earlier that we already have a two-tiered education system — one for the rich, and the other for everyone else. That is unequal. I had no idea that Germany bans homeschooling, with few exceptions. Interesting. I agree that homeschooled children should be able to socialize with other children. Children need socialization — it is a very important part of social and personal development. **60 Minutes** did a story years ago about a college (in Virginia, I think, but I*m not sure) that is specifically for homeschooled children. I understand that homeschooling parents have to become certified as teachers before they can teach. I am glad that article mentioned that it has more economically feasible for homeschooling parents. I understand that the materials for homeschooling are very expensive. The weekly get-togethers that one of the mothers profiled in the article has her son attend is a good idea, too. Thank you for sharing the links to these articles. It’s much appreciated. I read both articles and I found especially the first article about the school to prison pipeline to be particularly heartbreaking. I was aware of most of the race riots in the second article as I have studied these topics on my own during the past few years. I’m so glad and happy to see others who have worked in the education field! Currently, I am working in a school and have noticed the same things that you guys have shared. I notice that white people at school have a particular interest in the Hispanic students (who are illegal and many have trouble coming back into the states when they leave to visit their home country). I really want to help the black students. I know what it’s like to go through the education system here. As a youth, I went to a predominately white school and only once felt that a teacher wanted the best for me (because she told me I could take a test to place out of an entire year of math). Other teachers seemed to pity me and some seemed okay, but I believe they helped the white students much more. I’ve also been suspended and put up for detention for petty things like forgetting to go to my locker (detention was scheduled to be on my birthday; I went there and my mother yelled at the teacher and pulled me out). Also was suspended for an entire week from school for having medicine in my backpack! And that was placed on my permanent record which probably didn’t help my chances of getting into college. Working at a school is stressful and I feel like a lot of the black teachers don’t put specific attention or provide additional help to black students; the thing is that other teachers of different races provide that attention and give additional resources to their race of students. Like Phazex mentioned, where does that leave the black students? I have been disappointed that black students I’ve tried to give additional resources to and help have responded back in a very disrespectful manner. We really just need to go back to having all black schools. I did want to point out that now the Segregation Academies are legal. I’m actually reading a book right now called Divided We Fail: The Story of an African American Community that Ended the Era of School Desegregation by Sarah Garland. Who would have thought that we no longer have to have schools desegregated? Hmm. I find it interesting that during Black History Month and the Civil Rights Movement events this pivotal point in history is completely omitted in the discussion. You are welcome. I am glad that you found the articles interesting. Public education used to be good, but now because of so-called reforms (with few exceptions) it is a disaster — which white supremacists want. They know their kids will not be educated at a poorly-performing school. I agree with how teachers of all races have been taught to view Black children as trouble-makers. I have also been in situations where I tried to help Black students, and their reactions were cruel and disrespectful. Due to white supremacy, self-hatred has run amok among Black children. I can attest to this I have had self-hatred as well. Therefore, many Black children see Black teachers not as people to respect, but as people to disdain, since they look just like themselves. That sounds like an interesting book that you are reading! Thank you for the response, Courtney! Public Education used to be good way back in the ’40s and ’50s (really top notch in the early 20th century). It began to take a precipitous decline by the ’80s and ’90s; Like you said, public education has progressively gotten worse with all of the reforms (whole language, common core, NCLB, standardized tests). Today, students in many private schools get a rigorous education though (sentence diagramming, learning Latin, blue book exams etc. ), despite the failings of the public schools. I would warn others that just because their child may go to a predominately white school, it does not mean that they will have a superior education to their white counterparts (This includes private schools as well). The white supremacists make sure that doesn’t happen because they see it as a black person taking away a seat in a gifted class from a white student. Over the past several years, I’ve had to teach myself how to write better, learn basic geography, and history. I apologize if my writing is still subpar. Thank you for sharing your experiences. I thought I was the only one being treated by these black students in this manner. I will be sure to read the homeschooling article some time during the weekend. Several years ago, I was flipping through the channels and stumbled across a homeschooling documentary. It was MTV’s True Life. I don’t watch MTV, but this documentary was actually interesting. One of the students they featured was black and he tried to go to his public high school for classes. He later decided he would just enroll in school for extra curricular activities because the classes were too easy for him. I was elated to see that another black person was not intellectually stifled by the system because his mother made an excellent decision to homeschool her son. Thank you for your excellent response! I greatly appreciate it! I went to high school during the 1980s, so I remember sentence diagrams, which I thought were confusing. However, things have been made too easy for kids. They really aren*t taught how to think in order to solve problems and to write well. They are not being challenged. Some teachers (usually White) have low expectations of these kids. One of my former colleagues actually told me, **Some of these kids are only going to make 70s anyway. ** Unfortunately, when teachers try to challenge students, they are prevented from doing so. In fact, teachers are expected to teach a certain way, and if they don*t, they are given a hard time. I have heard other Black people say that integration makes Black people think that if Black children sit next to Black children, then they will do better in school. That adds to a sense of inferiority among Black children. I had problems with math throughout school, but I did not really improve my math skills until I studied math while I was studying for the GRE years ago. So you are not the only one. And your writing is fine. It is interesting about the Black student in the MTV documentary. That fact that he felt the public school was too easy for him says a lot about the state of public schools today. I read the homeschooling article yesterday. It was great! I really liked how there were parents working with their children to get them up to pace AND not relying on the school. I also found it touching that the single mother was working with her Autistic son. Many other races work with their kids in addition to having their children attend public school. Quite frankly, we are targeted as a people in the public schools and to me it is more work to remedy any academic deficiencies AND psychological abuse the child endures. So many black parents allowed their children to be classified and placed into a special education classroom that is slower than the general ed classroom. It’s really a pity because the schools can’t place the children (at least legally) without the consent of the parent. I was super ecstatic after reading the article that the parents took matters into their own hands. Have you heard of Marva Collins? Here is a 60 minute segment on her school. Do you remember the Bell Curve? The segment mentions that briefly too. I think her school closed down though. Unfortunately because parents wanted to put their children in charter schools. From what I’ve observed with charter schools I’ve visited, they have A Lot of White teachers. The kids at that school got a great education! And they were taught to read at 3 1/2 or 4 years old. The former students have such confidence. Such an inspirational video that gives me a lot of hope. The only thing I would say is perhaps not having such an emphasis on eurocentric education. I don’t know if they teach the children about the true history of black people. Here is a movie starring Cecily Tyson about the Marva Collins Story. Thank you for reading the homeschooling the article. I found it to be very interesting. I agree with you that these Black parents did what I suggested that more Black parents need to start doing — becoming involved in their education. These parents, however, went above and beyond by taking their children out of schools that were failing them, homeschooling them, and making sure that they kept pace without the help of the school. I was intrigued about the single mother with the autistic son. So many people are so quick to slam single mothers, but there are many single mothers out there who care about their kids and will go out of their way to help them with their schooling. Thank you, thank you, thank you for showing the Marva Collins story! Yes, I know who Marva Collins is, and I remember watching that **60 Minutes** segment a long time ago. I did not see the reunion with her former students until today, and I was very glad to see that. I remember reading about **The Bell Curve**, which is basically white supremacist junk. I am sorry to hear that her schools may have closed down. Charter schools are no better that public schools, and studies have shown this. Also, a lot of charter schools are losing their accreditation throughout the country, and teachers do not have to be certified to teach in charter schools. I also agree with you about the Eurocentric education. I did not read Shakespeare until I was in high school, and it is impressive that these kids were being taught Shakespeare and Chaucer in elementary school. However, you can teach the truth about Black history and the African Diaspora as well as the Eurocentric stuff (you will get it in college, anyway). There needs to be more emphasis on teaching Black children about Black history. Yes, I watched the movie about Marva Collins a long time ago with my parents, and it is a good movie. Thank you for posting it as well. As you stated, I am of the mind-set as well that Black scholars should teach Black students. Thank you for the response, Phazex. I strongly believe having white teachers for over 12 years of a person’s formative years is incredibly detrimental to one’s psyche. In the past, I believed that it didn’t matter much. As long as a person learned what they needed to. But now, I feel that black students who are taught by non-black teachers, particularly white teachers, will feel and sense the neglect and hostility that the teacher feels towards their black students. This can make the students feel “comfortable” with this type of treatment which could over time erode the student’s self esteem. Here, I can’t speak for others, but with my own experiences, I feel subconsciously, I believe that white people are mostly right or know much more than I do because I’ve spent so many years having them teach me in a classroom. Of course, I know now that is a bunch of nonsense, but it is difficult to break this assumption. This to me is probably the most dangerous effect of spending years with only white teachers. Of course, this can be avoided if we have black schools WITH black teachers. As long as we rely on our oppressor to educate our children and future generations then we will remain oppressed. End of story. The video is interesting and the speaker has shown many excellent points about Common and Raven Symone. Common is a great lyricist and a great rapper. He has talked about diverse issues. I do disagree with Common’s statements on the Jon Stewart show though. Common believes that forgetting the past and shaking the hands of white people will automatically end racism. That won’t work, because our black people have shaken the hands of white people for centuries. We have tried a lot of actions of passive acceptance, but that will not work, because we have to struggle and fight for our freedom. There is no freedom without struggle. The person in the video talks about moral relativism being a strong philosophy found in modern day society. Moral relativism believes in no moral standards, and a lack of embracing firm integrity. We do see an epidemic of too many people in the world that want to be totally concerned with themselves instead of focusing on helping others. Some have too much of a concern with an IG post than freedom and justice for humanity. The heroes of Selma didn’t believe in post racial propaganda. They actually stood up and fought back against oppression. Common’s statements disappointed me, because Common have said pro-black conscious statements previously for years. Raven Symone’s statements were not unusual, because she said that she doesn’t consider herself an African American. She said that the Univision host didn’t say anything racist about First Lady Michelle Obama. The Univision host’s words about Michelle Obama were sexist, racist, and evil. The First Lady is a beautiful black woman and she should never be called out of her name. Also, Rosie Perez in the View did told the truth that some Hispanics are racists and many Latinos have black African heritage. There are racist anti-black images found in Mexico, the Dominican Republic, and throughout Latin America. Yet, it is also important to mention that many Afro-Latinos are anti-racist activists. There are Afro-Brazilians in pan-African organizations that are fighting back against racism and discrimination in Brazil. The Afro-Latinos, the Afro-French, etc. are always our Brothers and our Sisters. Some in the younger generation do have a narcissistic, post-racial attitude, but many young people have a strong social consciousness and they desire the liberation of all black people globally. The statements of Common and Raven Symone prove to us that we don’t live in a post-racial society. Racism does exist. We see black men, black women, and black children being killed. We see an issue of depression and other forms of mental illness among some of our people. We are fighting HIV/AIDS in our community. We have an undying love for our people. We need economic and racial justice in order for us to be free. They care NOTHING ABOUT BLACK PEOPLE, when will we understand that? I don’t care what they say, I don’t care what they do, they DO NOT REPRESENT THE BEST INTERESTS OF BLACK PEOPLE. the most successful owe their allegiance (and possibly their mortal souls) to their white masters, make no mistake, that’s why i spend ZERO TIME trying to “figure out” what they meant or what they said. I cannot imagine a Jewish entertainer saying Jews should just forget the past and move on. I cannot imagine a Jewish entertainer saying he didn’t care about the Jewish holocaust. I OWE THEM NOTHING AND NOTHING IS WHAT THEY WILL GET FROM ME. Yes, the majority of black celebrities follow the interests of white mainstream society. Therefore, we can’t be surprised when some of them make outrageous, anti-black statements. One great aspect of life is to use discernment and to not ally with those who don’t respect the interests and the intelligence of black people. 2015 is differently a year where we are presented with clear evidence of the white elites using black puppets in advancing the myth that forgetting the past and shaking hands with the oppressor will cause freedom. That hasn’t worked then and it doesn’t work now. History shows how treaties with the Native Americans and other people were broken by white racists. Hollywood was invented filled with deception and it continues deception today. I haven’t heard of a Japanese or Jewish producer say forget the Holocaust or the anti-human bombings of Hiroshima and Nagasaki. Since it is close to the 50th anniversary of the end of WWII, I have been studying WWII in a higher level. Lee Daniels and people like that have shown the world their disloyalty to black people, so we shouldn’t be loyal to them. Lee Daniels admitted that he’s a sellout and he should be treated as such. Some of our people place celebrities on a divine pedestal, but they are human. They are not demigods and they shouldn’t be worshiped. Real role models should be black male and female doctors, health advocates, teachers, lawyers, legitimate political activists, business leaders, and other strong, wise people who live their lives in accordance to Black Unity and black empowerment. Yet, we sit there and listen to their nonsense as though we are listening to words of wisdom. Also, one thing I’ve noticed is the only time black people get a MIKE or an interview on mainstream media is when they’re promoting anti-blackness (Raven), white supremacy, confusion or deception (Common). Otherwise, they wouldn’t get a second of time on air or in print. If we follow this principle, we will not be fooled or confused by ANYTHING they say or do. when white supremacy is a 24 hour/7 days a week system. Take off that hat and you could wind up with a brain concussion. Warning: This video contains abundant profanity. Here is my take on the video. The narrator Harvey has shown great emotions as it pertains to the story about Anthony Stokes. I wouldn’t blame him for showing great emotion, because Anthony Stokes has thrown his life away after he was blessed to receive a heart implant. I have no sympathy for the evil acts of Stokes. Harvey is right to condemn Stokes’ actions as wrong. It is wrong to shoot at an elderly woman and to assault a pedestrian. We want justice, but we want integrity and morality to exist in the world as well. The narrator is to correct to mention that white racists will exploit Anthony Stokes’ story as a way for them to blame the black collective. I’m not glad that he is dead. I wish that he was placed into jail for his crimes and I wish he would have never done those crimes in the first place. I wished that the elderly woman wasn’t shot at and that the pedestrian wasn’t hit either. I disagree with Harvery on dreads. Just because a Brother wears dreads doesn’t mean that a Brother is a nefarious criminal. Many suit and tie corporate elites have done more crimes internationally than people from poorer communities. We have to condemn crime in the ghetto and we have to condemn crime done by Wall Street bankers too. Not all 90s baby are irrational nihilists. The story of Anthony Stokes proves that evil crimes are immoral and we need more community development strategies so we can end crime in general. I don’t agree with Harvey using slurs and profanity, but we all understand his frustration. We all have the right to express frustration at how one person has done so much evil after receiving a heart implant. The evil actions of Anthony Stokes should be totally condemned unconditionally. Also, we should continue to fight for the truth. The war is not over, but we can help others. When we help others, we bless others and ourselves. Life will not be totally easy, but we carry on as human beings. We, as black people, deserve true liberation. Here is a great story! Yes, the story is excellent. Brother Harold Ekeh used hard work and has a strong family support system to help him achieve great things. By his own merit and by his own creative genius, he made high scores on the SATs and he wants to be a neurosurgeon. His actions should definitely inspire black people to never give up and to keep on fulfilling their aspirations in his life. He has been accepted to numerous Ivy League. You can tell that he loves his family and his community. He’s from Nigeria. Ironically, many African Americans can trace their ancestry back to Nigeria including other places of Western Africa. Also, Nigeria has the highest population of black people in any location on Earth. Science is part of his gift as a human being and he will cultivate it as a way for him to help humankind in general. That’s great. Thank you Sister for showing this story. Thank you and you are welcome! I was so glad to read this story! You are right; it is inspirational. I knew that Nigeria is a heavily-populated country, but I did not know that it has the largest Black population of Black people in the world. Thanks for the info!